News, Articles, Videos and More!!! NASA is plotting a daring robotic mission to Jupiter’s watery moon Europa, a place where astronomers speculate there might be some form of life. The space agency set aside $15 million in its 2015 budget proposal to start planning some kind of mission to Europa. No details have been decided yet, but NASA chief financial officer Elizabeth Robinson said Tuesday that it would be launched in the mid-2020s. Robinson said the high radiation environment around Jupiter and distance from Earth would be a challenge. 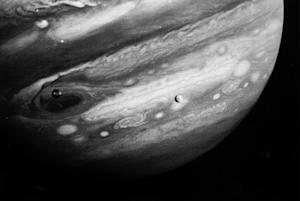 When NASA sent Galileo to Jupiter in 1989, it took the spacecraft six years to get to the fifth planet from the sun. Last year, scientists discovered liquid plumes of water shooting up through Europa’s ice. Flying through those watery jets could make Europa cheaper to explore than just circling it or landing on the ice, said NASA Europa scientist Robert Pappalardo .Past NASA probes have flown by Europa, especially Galileo, but none have concentrated on the moon, one of dozens orbiting Jupiter. Astronomers have long lobbied for a mission to Europa, but proposals would have cost billions of dollars. NASA will look at many competing ideas for a Europa mission, so the agency doesn’t know how big or how much it will cost, Robinson said. She said a major mission goal would be searching for life in the strange liquid water under the ice-covered surface. CAPE CANAVERAL, Florida – NASA budget plan for 2015 includes funding for a robotic mission to an ocean-bearing moon of Jupiter and could help boost commercial ventures to fly astronauts to the International Space Station, NASA officials said on Tuesday. The White House is requesting a $17.5 billion budget for the U.S. space agency in the fiscal year that begins October 1. That marks a 1 percent decrease from NASA’s 2014 budget. But NASA could also have access to an additional $900 million from the President’s proposed Opportunity, Growth and Security Initiative, a $56 billion fund for special projects that is separate from the regular budget. If approved, the agency would have $1.1 billion next year to help at least two companies develop commercial space taxis to fly astronauts to and from the space station. The $100 billion research outpost, a project of 15 nations, flies about 260 miles above Earth. Since the space shuttles were retired in 2011, the United States is dependent on Russia to fly crews to the space station at a cost of more than $65 million a seat. For now, escalating U.S. tensions with Russia over the crisis in Ukraine have not affected the space partnership, NASA Administrator Charles Bolden told reporters on a conference call. “We are continuing to monitor the situation,” Bolden said. “Right now, everything is normal in our relationship with the Russians,” he said. Currently, NASA is supporting space taxi designs by Boeing Co, privately owned Space Exploration Technologies and privately owned Sierra Nevada Corp. The agency intends to select at least two companies for a final round of development funding this summer. NASA wants to have U.S. options for flying astronauts to the station before the end of 2017. The so-called Commercial Crew program is receiving $696 million for the 2014 fiscal year ending September 30. The proposed funding increase would add as much as $400 million to the program for fiscal 2015. The new budget also includes $3.1 billion for NASA to operate the station and provides $2.8 billion to continue development of the Space Launch System heavy-lift rocket and Orion capsule for future human missions to the moon, asteroids and Mars. An unmanned Orion test flight is scheduled for September 18. One of the first operational Orion missions would send astronauts to an asteroid that has been robotically relocated into a high orbit around the moon. Planning for the so-called Asteroid Redirect Mission gets a boost to $133 million in the 2015 budget proposal, up from $78 million in 2014. As currently envisioned, hiking spending on the asteroid initiative means cutbacks in other programs, warns the Coalition for Space Exploration, a Houston-based industry advocacy organization. “We remain concerned and opposed to the annual effort to drain funds from our nation’s exploration programs,” the group said in a statement. Science missions would share nearly $5 billion in 2015, including $15 million to begin planning for a mid-2020s mission to Europa, an ice-encrusted moon of Jupiter. Scientists have strong evidence that the moon has a vast ocean beneath its frozen surface. Water is believed to be essential for life. “It’s one of those places where life might occur, in the past or now, and so we’re really excited about going there,” said NASA’s Chief Financial Officer Beth Robinson. The proposed budget keeps the Hubble Space Telescope successor program – an infrared observatory known as the James Webb Space Telescope – on track for launch in 2018. It also lets NASA begin planning for a new telescope to probe the mysterious force known as “dark energy” that is driving the universe apart at faster and faster rates.